Charles Williams, a professor and career mentor in Butler’s Lacy School of Business for 22 years, will be honored for his lifetime contributions to the city of Indianapolis on Hoosier Heritage Night, Wednesday, June 7, at the Ritz-Charles in Carmel. Williams spent his 24-year career as an engineer for Indiana Bell, which became Ameritech. “As a career mentor, Charles has positively impacted hundreds of lives by providing career and professionalism guidance to students through the Lacy School of Business Butler Blueprint four-year career development program, helping them discover their paths and launch into successful careers,” said Kim Goad, Director of Professional and Career Development in the Lacy School of Business. 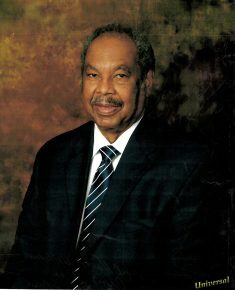 Williams is a founding member of 100 Black Men of Indianapolis Inc. and serves on the Board of Directors of the Martin Luther King Multi-Service Center and the Morning Light Abbie Hunt Bryce Home. He is a former board chair of the Indianapolis Urban League and Visiting Nurses Corp. He received community service awards from two Indianapolis mayors, Bill Hudnut and Greg Ballard, served on the Heritage Place Board representing Butler, and was appointed by former Butler President Bobby Fong to serve on the University's NCAA committee. Williams is one of six Hoosiers to be honored at the event. The others are Carl Erskine, Ann Noblese, Deborah Hearn Smith, John Myrland, and Darrell “Gene” Zink. Charles Williams will be honored for his lifetime contributions to the city of Indianapolis on Hoosier Heritage Night. Schaub, 75, said that’s one of the many things he’ll miss about Butler when he retires at the end of this academic year. He will also miss the students (“We’ve always attracted very nice young people who come from good family backgrounds and are sensible 18- to 22-year-olds”), his colleagues (“Everyone is very talented and qualified in the areas they work in, so we have a coherent and, I think, successful approach to theatre”), and the classes he’s taught in both theatre and the core curriculum. In the Theatre Department, the soft-spoken Schaub is known for his encyclopedic knowledge of theatre history. Schaub grew up in Massapequa, New York, son of a construction-equipment operator and licensed practical nurse, in a house where he could hear the Atlantic Ocean and was in proximity to New York City. He “stumbled” into theatre almost literally, when he saw a high school friend moving a lighting rig through the halls. Schaub helped him carry the lights and soon was involved in a production. He went to Hofstra College (now Hofstra University) for his bachelor’s degree in theatre, graduating in 1963, and spent 2½ years in active duty in the Army, mostly in Germany. There, he met Heidi, the woman who would become his first wife. They had their first daughter there, then moved to Bloomington, Indiana, where Schaub earned his M.A. in Theatre. He started his teaching career at the University of Hawaii (and Heidi gave birth to their second daughter in Honolulu), then moved on to Dalhousie University, Kent State—where he earned his doctorate in theatre—and Newberry College in South Carolina. In 1980, he answered an ad seeking a Theatre Department Chair at Butler University. Schaub said that when he started, he wanted to be a good technical director and then a good scene designer—“and that’s what I did for a long time.” Timmerman said students from the past 15 years probably don’t know that Schaub worked in the design and tech part of Butler Theatre productions during his early years here. 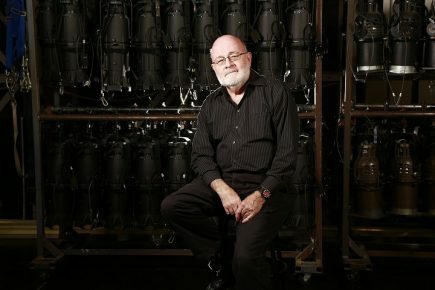 He designed lights for many productions and also designed and built sets. Soon, he added academic courses—dramatic literature, text analysis, five different History of Theatre courses he rotates. “Given my graduate education, I’m doing exactly what I was prepared to do by getting an M.A. and then a Ph.D., even though there were times when I was still designing and being a technical director,” he said. Schaub is proud of the students he’s taught, some of whom have gone on to be professors, lawyers, founders of theatre companies, and drama therapists. Jim Senti ’05, who went on to earn his MFA at Harvard University and now is an actor in Los Angeles and professor at California State University, Northridge, calls Schaub “one of the most admirable characters in my life so far.” Senti remembers when Schaub cast him in a role in the Caryl Churchill play Vinegar Tom that featured a lengthy monologue. In rehearsal, Senti stumbled over the words. He went to the side afterwards, clearly frustrated. In 2006, Schaub wife, Heidi, died of breast cancer. A couple of years later, he met a woman named Donna McCleerey at a group bereavement session. They found out they had something in common—they both worked at Butler. (She is the administrative specialist for the men’s basketball team.) This year, they will have been married nine years. When the school year ends, Schaub will have spent 47 years teaching in college and 60 years in the theatre. 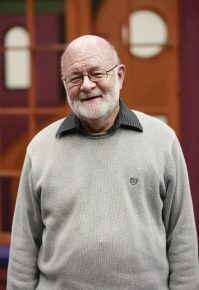 Both teaching and theatre will play a part in his retirement: He’s planning to continue writing an analysis of Hamlet that he started during a sabbatical in 2015. And a Bulldog at heart. “Having been at Butler has been a very warm, rewarding and humane experience,” he says. 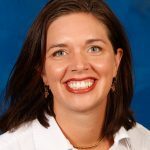 Associate Professor Kelli Esteves, who has taught in the College of Education since 2010, has been named the Richard W. Guyer Chair in Education. Before joining the Butler faculty, Esteves taught as an Assistant Professor of Education at Aquinas College. She also has taught in the Rockford (Michigan) public schools as a special education teacher. Esteves earned her bachelor’s degree from Hope College and her Master of Arts and Doctor of Education from Western Michigan University. Her areas of expertise are inclusive practices, response to intervention, children’s literature, and developmental theory. The chair is named for Richard W. Guyer, a native of Indiana, who received his B.S. in education from Butler in 1948, an M.S. in 1950, and an Ed.S. in 1967 from the University. He received his Ed.D. from Ball State University in 1969. A World War II veteran, Guyer began his career in education as a teacher and head football coach at Crawfordsville, Indianapolis Howe, and Franklin Central high schools. He later served as athletic director, vice principal and principal at Franklin Central. Guyer served as an adjunct faculty member at Butler for several years before becoming a full-time faculty member in 1968. He taught undergraduate and graduate courses in administration and also served as the director of student teaching and field experiences, director of educational placement and director of undergraduate studies for the College of Education. He retired from Butler in 1986 and enjoyed professor emeritus status until his death in 2000. The Richard W. Guyer Professorship in Education was established in 1997 by D. Michael Hockett, a 1964 graduate of Butler University and an Indianapolis businessman who was deeply influenced by Guyer’s teaching and guidance. Faculty members hold the Guyer Chair for three years. In many ways, from participating in Pinewood Derby to playing near construction sites, Associate Professor of English Chris Forhan’s suburban Seattle childhood had a Leave It to Beaver-like quality. But then, Ward Cleaver wasn’t an undiagnosed manic depressive who took his own life when the Beaver was 14. The happy and the horrible times of Forhan’s youth—and what happened after—are the subject of his starkly honest memoir, My Father Before Me (Scribner, $26), which comes out June 28. Chris was the fifth of eight children born to Ed and Ange Forhan. His parents never talked about personal or emotionally difficult topics, and there was a lot of family history he didn’t know. 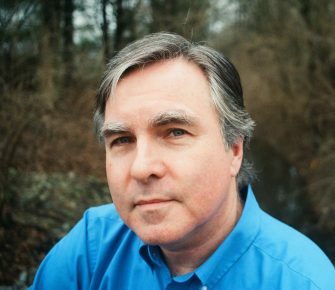 So in 2010, he began researching—interviewing his mother and siblings, scouring Ancestry.com, the Seattle Times archives, and other Internet sites to glean what he could about his father. What Forhan uncovered in his reporting and writing is in many ways an ordinary story about families and family dynamics. The specifics are unique to the Forhans, but the themes are universal. During an interview in his Jordan Hall office, Forhan talked more about the book and his family. Q: Tolstoy wrote: “Happy families are all alike. Every unhappy family is unhappy in its own way.” What do you think made your family uniquely unhappy? A: I don’t know that we were uniquely unhappy. And you know that Tolstoy quote is famously controversial—easily quotable but not necessarily true. To push against your question, I hope that we were representative. I think my parents are representative of certain values and habits of the culture they came from and the generation they were a part of: two Depression era babies. My father was Irish Catholic and my mother, while not particularly religious as she was growing up, came from a Scandinavian background. Those two cultures are just generally known as cultures that nurture repression and deflection. But I think my parents are representative of a time and a place and certain cultures. My father, though, had a particularly horrific upbringing. His father abandoned him and his brothers and mother. His mother I don’t know a lot about because he didn’t say a word about her to us. I infer that she was not completely dependable as a mother. And his little brother drowned at 5, when my father was 7, and then his mother died when my dad was 11. All he knew, it seems to me, was loss and instability in his childhood. Then he was raised by grandparents who were caring but distant and put a lot of responsibility on him to be the good boy, the successful boy—whatever that might mean. And he came from a generation that was about not looking inward. So he had particular demons that I don’t think he confronted sufficiently. And then he got sick—he got diabetes. He seemed to be manic depressive, but probably not diagnosed as such. My mother was exceedingly strong. She kept a stiff upper lip to the degree it was possible and always made sure the trains ran on time. She helped shelter us eight children from the worst of our father. We were happy in our own way. There was great joy. But the unhappiness had to do with that silence and mystery. We were just hunkered down in our rooms. My brother and I talk about how we kept our heads down. That’s how it felt. Q: Your memoir is different from a lot of others in that the typical memoir is someone’s recollections. In your case, there was a lot you didn’t know, and you had to do reporting to find out. What was that process like? A: That was fun. And I’m sure I would have not written the book if a lot of research had not been involved. That was what compelled me to write the book. I wanted to figure out my father. I came to a point in my life—I was turning 50—where I said, “What was that, anyway?” It seemed like history. There was this historical period that obviously affected me and was still in memory, but I had never figured it out and I was very curious. Who was this man? Who were the people who came before him and might have made him who he was? I really wanted to figure him out. And through that research, I came to know him in a way I never had before—as if he were still alive. Q: In the chapter immediately after your father commits suicide, you have direct quotes from your mother and your siblings about their recollections. What was it like to gather that? A: I felt that was important to do. I know it’s my memoir—I told my mother and all my siblings that I was doing this project—but I did understand that this was something that happened to my family. There were eight children and we were all different ages, so we had different experiences. My sister Theresa was 24 when my dad died and my little sister Erica was 5. Different experiences completely. So I thought it was important to open up the windows of the book and let the air come in. All these different voices, different perspectives. So I wasn’t pretending mine was the only experience. And secondarily, I wanted to give my siblings that gift. I knew he was their dad, too, and here was a chance for them to say what it was like for them. Q: How comfortable were you in divulging personal details about yourself? A: Pretty comfortable. When I decided to write this, I was all in. The most embarrassing thing I described was receiving a phone call at the high school radio station where I worked and swearing at the caller, thinking he was a prankster friend of mine. Just a stupid kid mistake. I still feel intensely guilty about that. But I felt OK otherwise. I wondered how my mother would feel about my telling the story of her life. And I was so honored and feel so lucky. She never said, “Don’t tell my story. Don’t tell the details.” She shared the details with me and she knew very well I would use them. She just asked me to change a couple of things that were factual errors or about which she had a different memory than I did. So I haven’t felt conflicted about sharing my experiences. This was a theme of the book. I was tired of the silence. So why not share it? Q: I was surprised that after your dad’s suicide and the family’s memories, the book goes back to being your story. He’s part of the story, but he doesn’t become a distraction. A: That’s a nice way of saying that the book is incoherent (laughs). His silence in some ways became my silence, and the last third of the book is about me dealing with that silence. Writing the book is a way of counteracting that silence, but it’s also about finding poetry—a way to use language to communicate what is real instead of to obscure it. Q: What do you think your father would think of the book? A: I’m not making this up—sometimes, when I was writing the book, and I was deep into it, and I was confronted with some riddle about him—I thought, well, I’m going to call him up and ask him. I really had this sense that he was so real to me and so alive on the page. But of course, if he were alive, I wouldn’t be writing the book. I have no idea what he would think. One part of me thinks he would be embarrassed and find it presumptuous of me to do what I’ve done. On the other hand, would he be the 85-year-old guy who’s got some perspective on his life and actually would find it touching that I would devote attention to his life in this way? I wish I had a pithy answer, but I don’t. The happy and the horrible times of Forhan’s youth—and what happened after—are the subject of his starkly honest memoir, My Father Before Me .